It’s only July but at Annalee Headquarters we’re always looking ahead to Christmas! The elves in our workshop tinker and plan to bring you the very best and brightest each holiday season. We spend countless hours choosing the right fabrics and accessories to perfect our designs and make them shine. Each year we release NEW festive themes—and 2018 is no exception. While stringing lights, curling ribbon, and hanging wreaths are months ahead—we’re proud to introduce Jingle Bells, Northwoods, Plaid Tidings and the NEW Holiday Baking Collection for 2018. Jingle bells, j-j-jingle bells, jingle all the way! Named for the favorite Christmas carol, this collection features dolls in soft red corduroy with festive green accents. Jingle bells accessorize these traditional Christmas designs making this a musical theme! The collection features six jolly elves from 5 inches to 14 inches! It features unique Santas and even a Mrs. Santa. There are many fun animals, too, including a Clydesdale, cow, deer, polar bear, and don’t forget the giraffe! Decorating is easy with this timeless collection. Do you like stopping by the woods on a snowy evening? We are so excited to release the Northwoods Christmas Collection featuring dolls in a cozy hunter green check and festive felt outfits! This unique theme is sure to be a hit in New England and beyond with pine cones and berries accents. Don’t miss the moose — he’s going to be a popular hit with his chipmunk, deer (available in multiple sizes), and charming mice buddies. This collection also has Santas and elves in two different sizes. 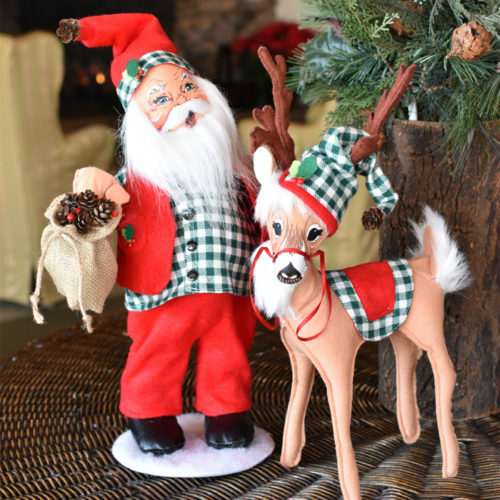 We love the 15in Northwoods Christmas Santa paired with the 12in Northwoods Christmas Deer. Looking to class-up your holiday decor? The elegant Plaid Tidings Christmas Collection features a festive print with some sparkly gold details and accessories. This is a formal twist on the classic red, white, and green solids that have all the elves here ooing and ahhing. With three unique elves in varying sizes, two endearing Santas and matching Mrs. Santas, and a mouse family too — it’s easy to see this theme proudly displayed on mantles and tables this holiday season. Looking for some unique friends? We adore the Plaid Tidings Kitty and Plaid Tidings Penguin! Who doesn’t love Christmas cookies and sweets? Each year Annalee is proud to release a handful of chef helpers in our Holiday Baking Collection. In 2018, this collection features a fun and festive peppermint candy print. The chef dolls in this theme are as sweet as can be! These designs make great host/hostess gifts and the perfect accoutrement to Santa’s plate of fireside cookies! What’s Your Holiday Design Idea? Believe it or not our designers are already talking about Christmas 2019! Do you have a suggestion for a design or a NEW theme? Share your Annalee design idea with us. We will contact to you if there is a chance it will be part of an upcoming collection. What Would You Like to See in the 2019 Holiday Collection? What’s Your NEW Favorite Holiday Design?